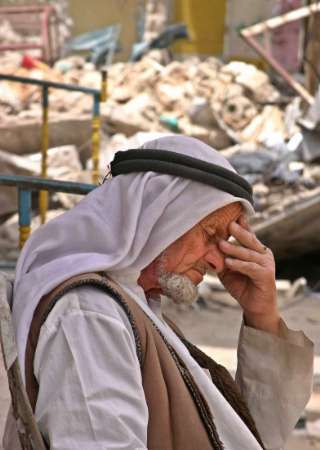 Rafah is the poorest town in the Occupied Territories. Its misfortune is that it is ruled by an Israeli government that does not believe Palestinians - even in an eventual "independent" Palestinian state - should ever be allowed to control their own borders. And Rafah lies on the border between the Gaza Strip and Egypt. For the last three years, the Sharon government has been slowly building an Israeli-controlled "security zone" between Rafah and Egypt, using "Israel's security" as the pretext to quietly raze one more row of houses at a time. Since 2000, 12,600 Rafah residents - already refugees from earlier periods of the Palestinian-Israeli conflict - have been deliberately made homeless in order that Israel can build its "security zone", which will leave Gaza isolated in Israeli-controlled territory and cut off from the outside world, just as PM Sharon proposes to do with the twelve cantons in which he intends to fence in the Palestinians of the West Bank. The army denies any such motive. But a clue to Israeli intent can be found in comments made on Israel radio a year ago by the then head of the military's southern command, which has responsibility for Gaza. Colonel Yom Tov Samya said house demolition was a policy and an end in itself, not a by-product of a search for tunnels. "The IDF (Israeli Defence Force) has to knock down all the houses along a strip of 300 to 400 metres. It doesn't matter what the future settlement will be, this will be the border with Egypt," he said. "Arafat has to be punished, and after every terrorist attack another two or three rows or houses on the Palestinian side of the border have to be knocked down ... This is a long-term policy. We simply have to take a very extreme step. It is do-able and I am happy it is being done, but it's being carried out in doses that are too small, I regret to say. It has to be done in one big operation". Today, PM Sharon is dispensing with the "small doses", and amassing IDF troops at the entrance to Rafah Refugee Camp in preparation for the "one big operation" that will illegally level hundreds of Palestinian homes. The residents of Rafah are currently salvaging what they can, and leaving their homes in preparation for the assault. I have put together a photo album of current events in Rafah, where the poorest Palestinians in the Occupied Territories are today preparing to become refugees for a second, third or fourth time in their lives. All in the name of "Israel's security". Update: 17 May 2004, 1154pm. Pace in Medioriente provides this satellite image (click to enlarge), showing the extent of the planned demolitions. According to the map, based on reporting from Israeli media, the homes of 117,000 Palestinians are scheduled for demolition. As long as the Arabs remain disunited, Israel and the US will take them apart bit by bit. Egypt and Jordan should have closed their Embassies and put troops on the border with Israel. As for the Saudis, words fail me. They could have used their money to buy US and Israeli politicians, exactly in the same way the Jews have bought US and Arab politicians. They had over fifty years to learn from the Jews that strength comes from unity. The Jews are a vengeful and hate-driven people, but you've got to give them credit for sticking together. As long as the Arabs don't understand that, they will not be able to get the US on their side. Israel is not strong without American help. They would not last a day. But they know also how to play the victim card. They are killing more Palestinians per day then the Palis kill Jews in one year, yet the impression is that it is the Jews who are the victims. "The Jews" are not "a vengeful and hate-driven people" any more than "the Muslims" are terrorists, or "the Palestinians" are genetically defective. Please don't make comments like that here. Apologies for the multiple trackbacks. I finally figured out that every time I edited my post, which I did to add some pictures, my blog sent a new ping. Not a problem, I tend to do the same thing.